Models with shells which, when open, do not jut out beyond the vehicle and are therefore considered for Double Use. 1. 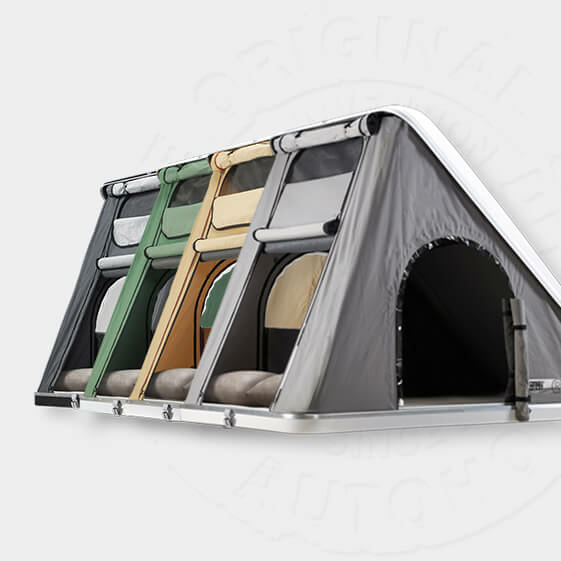 When travelling: If the Roof Tent does not exceed the vehicle shape including the open rear-view mirrors: for itinerant overnight stays everywhere, also in public and parking areas. 2. 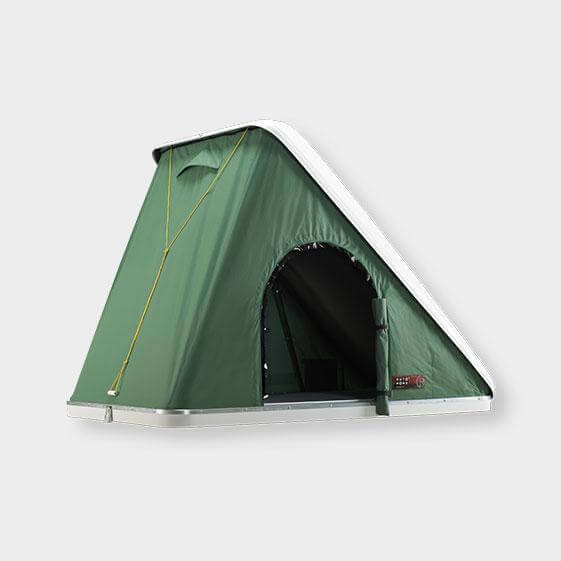 When camping: If the Rooftent is equipped with several additional accessories such as Verandah, Changing Room or Awning, it occupies further public space – because it exceeds the overall vehicle shape – thus, it is necessary to stay in private or camping areas. Medium: instead of the standard 210 cm long, this version is available at 230 cm in length. 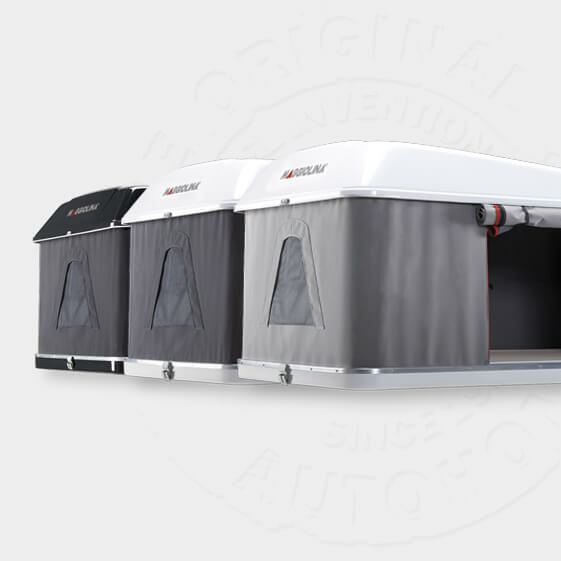 Includes: 4 universal clamps for attachment to roof bars, 1 opening handle, 2 doors and 2 windows, mosquito-netting on windows and doors, soundproof and anti-condensation roof insulation, 1 mattress and 2-3-4 pillows, 1 interior light, 1 height adjustable alloy ladder. (*) volume of shells with the tent closed. Medium:instead of the standard 210 cm long, this version is available at 230 cm in length. 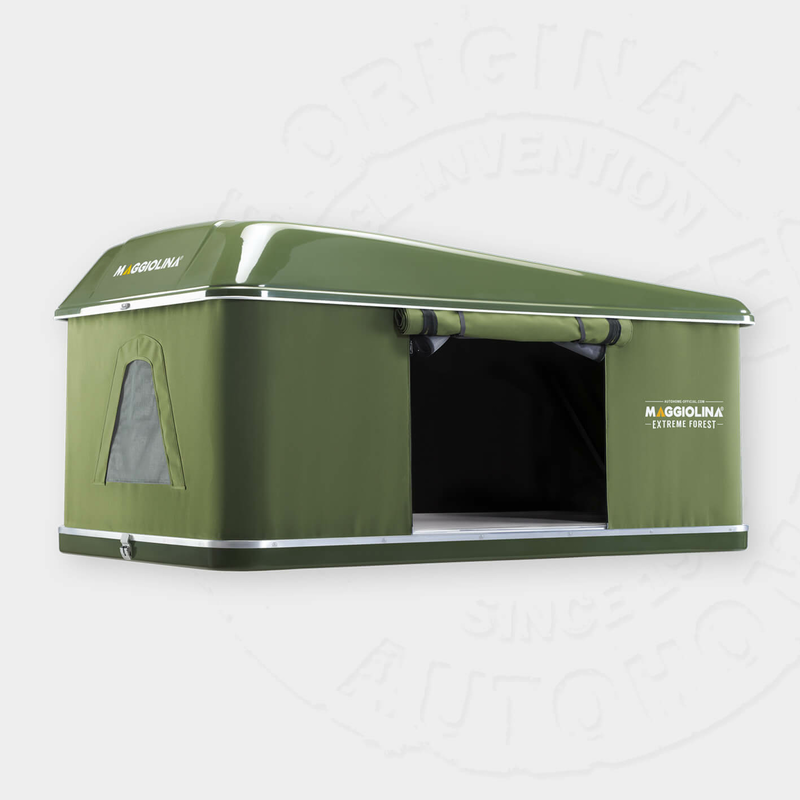 Includes: 4 universal clamps for attachment to roof bars, 1 opening handle, 2 doors with step by step opening and 2 windows, mosquito-netting on windows and doors, soundproof and anticondensation roof insulation, 4 removable pockets, stowage net, 1 mattress and 2-3-4 pillows, 2 air vents, 1 interior light, 1 height adjustable alloy ladder, ladder storage bag, elastic straps assist in folding the fabric when closing. 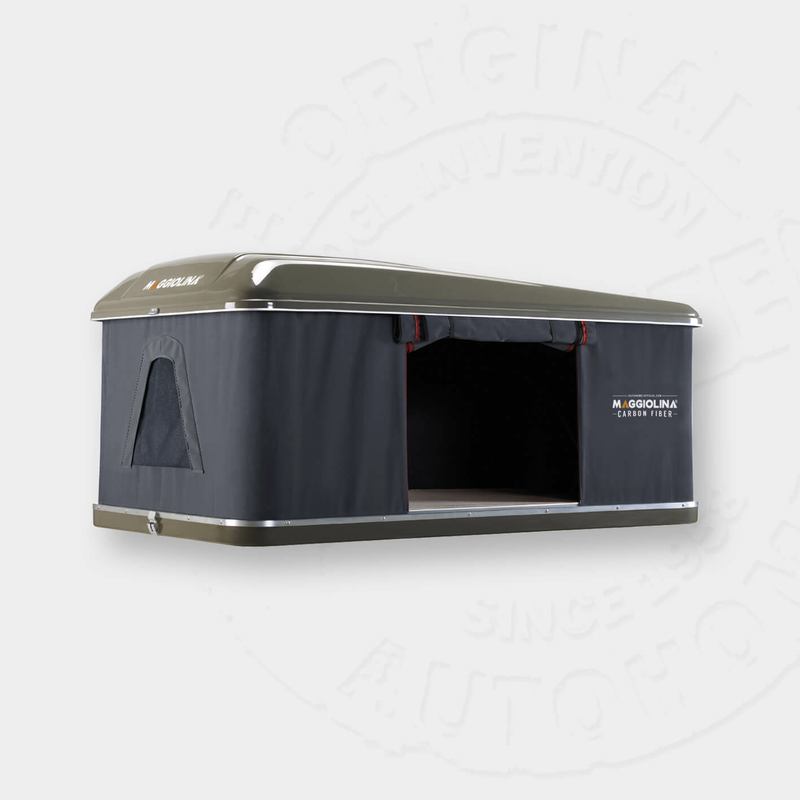 Includes: carbon fibre shells for maximum resistance and lightness, waterproof and transpirant dark grey dralon textile, 2 doors with step by step opening and 2 windows, mosquito nets on all windows and doors, 4 universal clamps for attachment to roof bars, 1 opening handle, soundproof and anti-condensation roof insulation, 1 mattress with 2/3 pillows, 2 air inlets, 1 head light, 1 height adjustable alloy ladder, ladder storage bag, elastic straps assist in folding the fabric when closing. 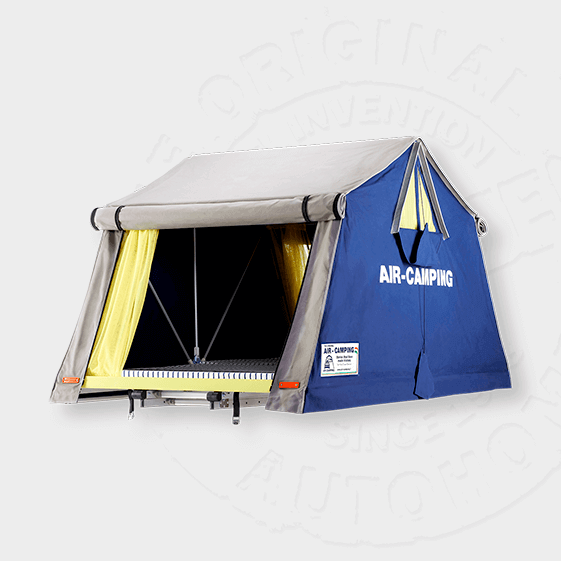 Includes: 2 adjustable load bars on the upper shell, 4 universal clamps for attachment to roof bars, 1 opening handle, 2 doors with step by step opening and 2 triangular windows, mosquito-netting on windows and doors, soundproof and anticondensation roof insulation, 4 removable pockets, stowage net, 1 mattress and 2-3 pillows, 2 air vents, 1 interior light, 1 height adjustable alloy ladder, ladder storage bag, elastic straps assist in folding the fabric when closing. 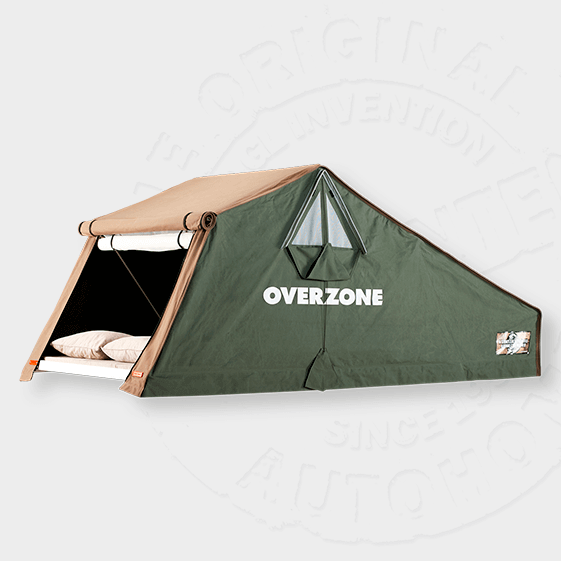 Includes: 2 adjustable load bars on the upper shell, 4 universal clamps for attachment to roof bars, 1 opening handle, 2 doors with step by step opening and 2 windows, mosquito-netting on windows and doors, soundproof and anti-condensation roof insulation, 4 removable pockets, stowage net, 1 mattress and 2-3 pillows, 2 air vents, 1 interior light, 1 height adjustable alloy ladder, ladder storage bag, elastic straps assist in folding the fabric when closing. 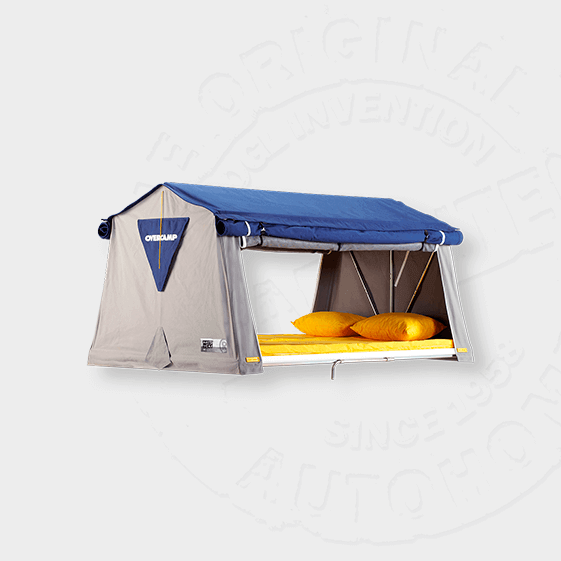 Includes: 4 universal clamps for attachment to roof bars, configuration for the attachment of auxillary bars on outer shell, 1 opening handle, 2 doors with step by step opening and 2 windows, mosquito-netting on doors and windows, soundproof and anticondensation roof insulation, 4 removable pockets, stowage net, 1 mattress and 2-3-4 pillows, 2 air vents, 1 interior light, 1 height adjustable alloy ladder, ladder storage bag, elastic straps assist in folding the fabric when closing. 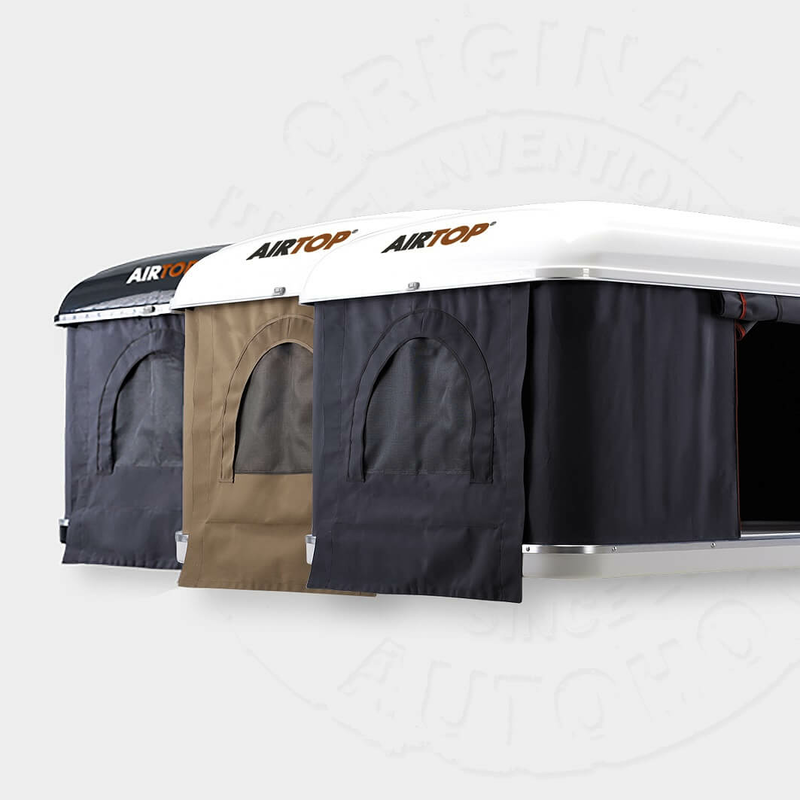 Includes: 4 universal clamps for fixing to roof racks or roof bars, 3 doors with step by step opening (1 each side and 1 on the rear), 2 semi-circular windows (1 front and 1 rear) 2 air vents, mosquito mesh on all doors and windows, anticondensation and soundproofing roof insulation, roof mounted stowage net, 4 removable pockets, 1 mattress and 2-3 pillows, 1 internal roof light, 1 height adjustable alloy ladder, ladder storage bag, elastic straps assist in folding the fabric when closing. We guarantee that all models of Fibreglass Shell Tents are skilfully constructed entirely by hand. 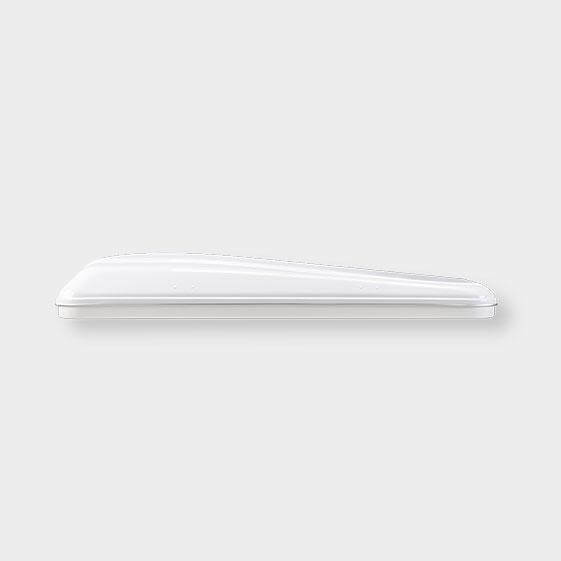 Their composition is very sable and will not weaken or fade over time like common plastic or similar products available on the market. 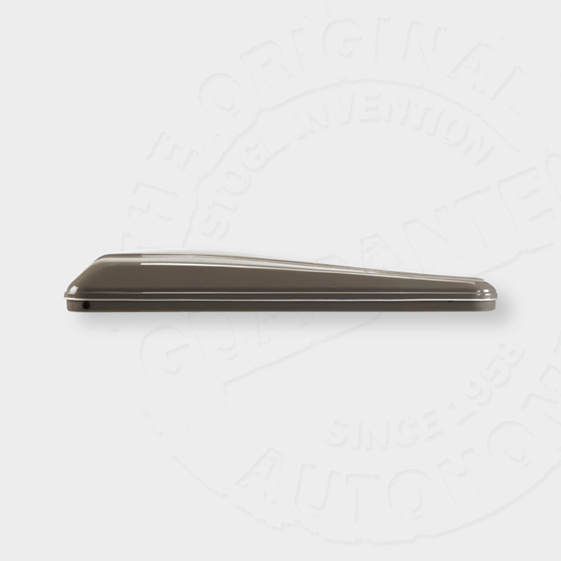 In addition, the composition of glass fibre polyester used, is a perfect insulator from hot and cold environments and if necessary can be easily repaired or painted to colour match your vehicle. 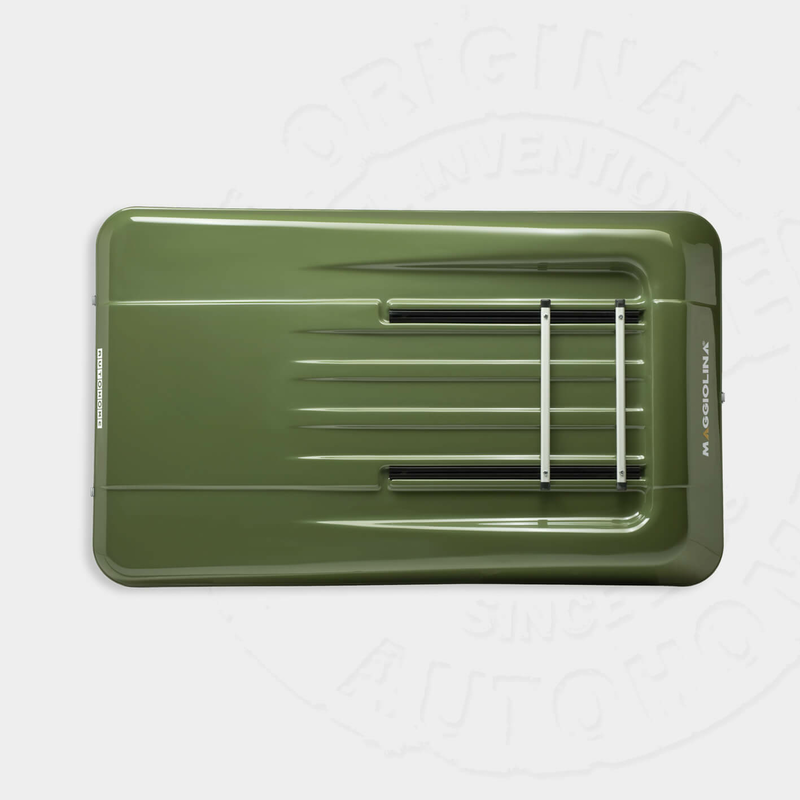 The GRP (fibreglass) outer shells are all hand made and finished, therefore some variations may appear in the finished weights (Manufacturers tolerance rate is within 10%). The above information is not binding. 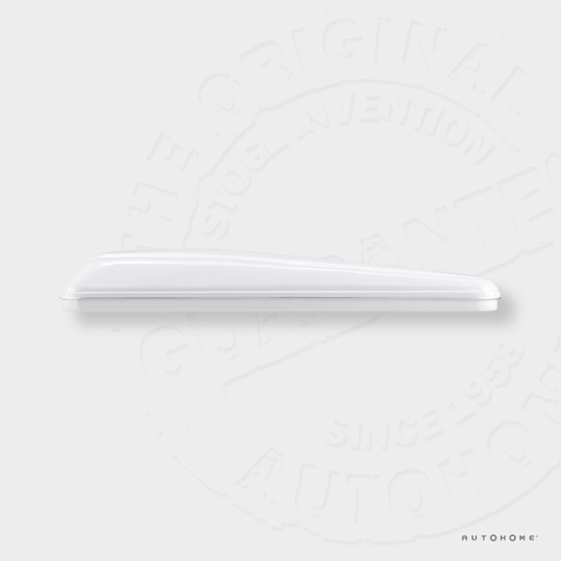 The manufacturer may carry out technical, construction and aesthetic improvements to its products without notice. 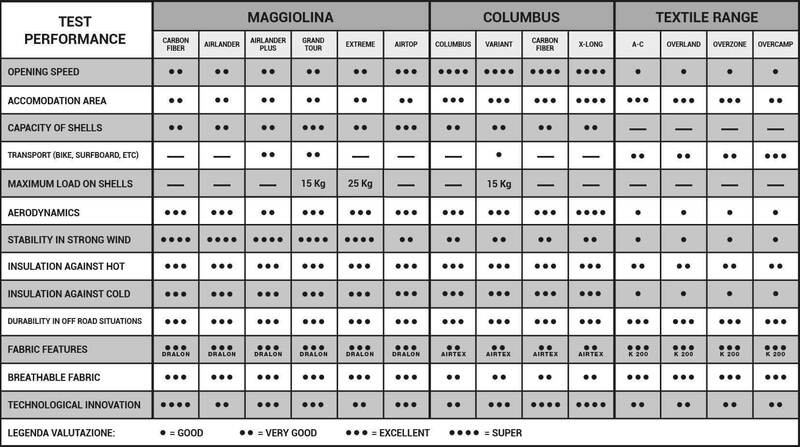 All technical data, colours, weights and measurements are purely indicative. 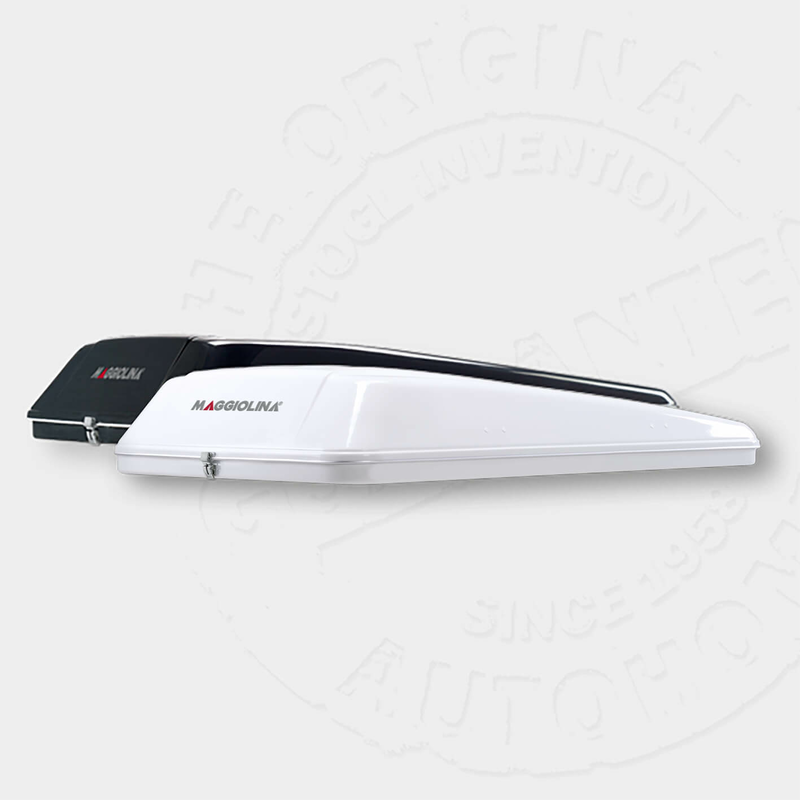 See the Regulations for Use, Maintenance and Warranty, an integral part of the product. The weights of hand-made products may vary. 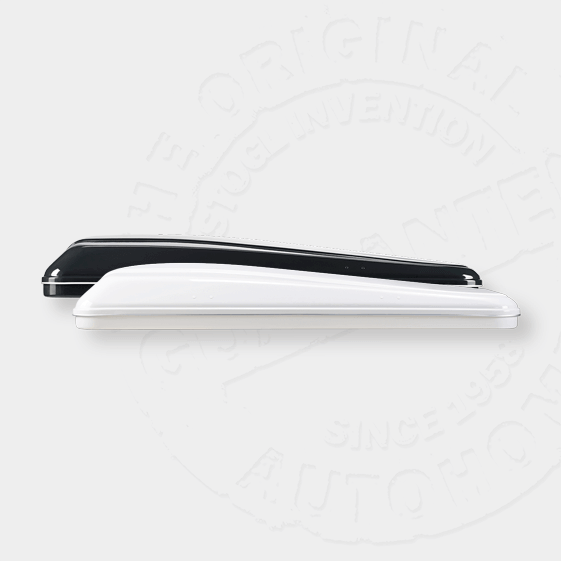 The X-Long version is suitable for longer length cars, camper vans, RV’s and 4×4’s. 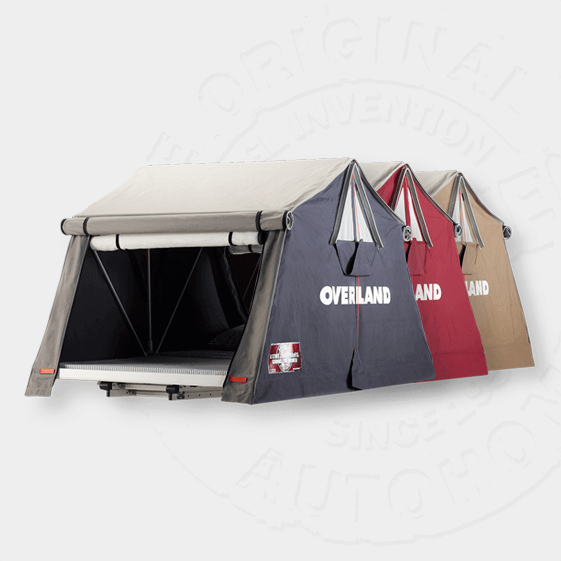 Includes: 4 universal clamps for attachment to roof bars, 2 door/windows with mosquito-netting, soundproof and anticondensation roof insulation, 1 mattress and 2-3-4 pillows, anti-condensation Air Cap, 1 height adjustable alloy ladder, elastic straps assist in folding the fabric when closing. Air Cap, ladder storage bag, elastic straps assist in folding the fabric when closing. 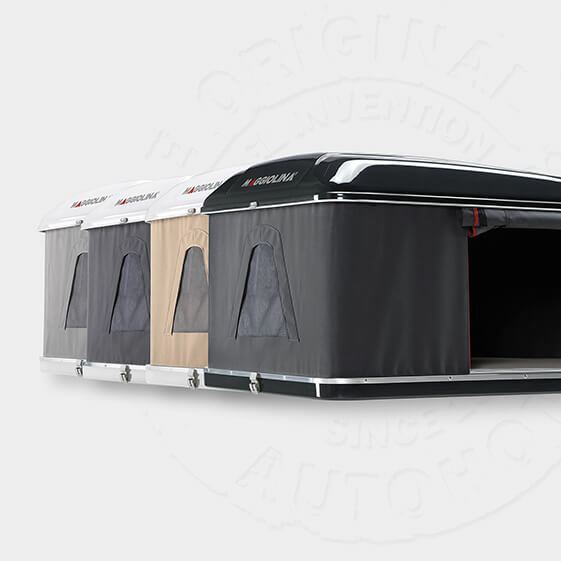 Includes: carbon fiber shells, 4 universal clamps for attachment to roof bars, 2 doors/windows with mosquito-netting, soundproof and anti-condensation roof insulation, stowage net, 1 mattress and 2-3 pillows, interior light, 1 height adjustable alloy ladder, full opening on the back with graduated darkening, outer door with Crystal window, anti-condensation Air Cap, ladder storage bag, elastic straps assist in folding the fabric when closing. Law Court: Mantova – Italy. 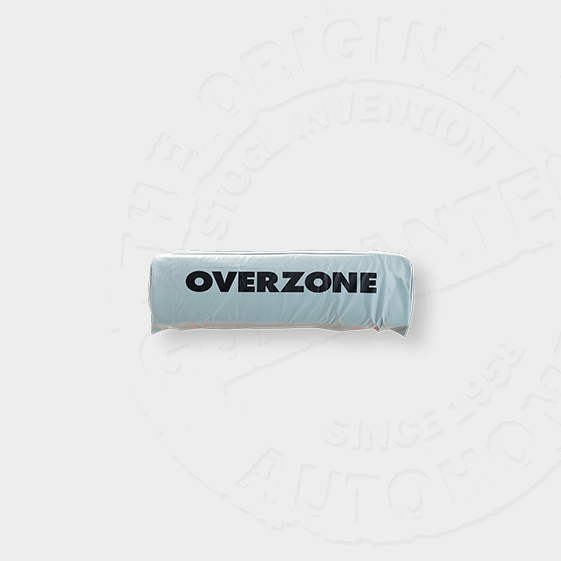 Overland, Air - Camping and Overzone are the recommended ranges for use in camp sites or private parking areas. Public parking spaces cannot be used. 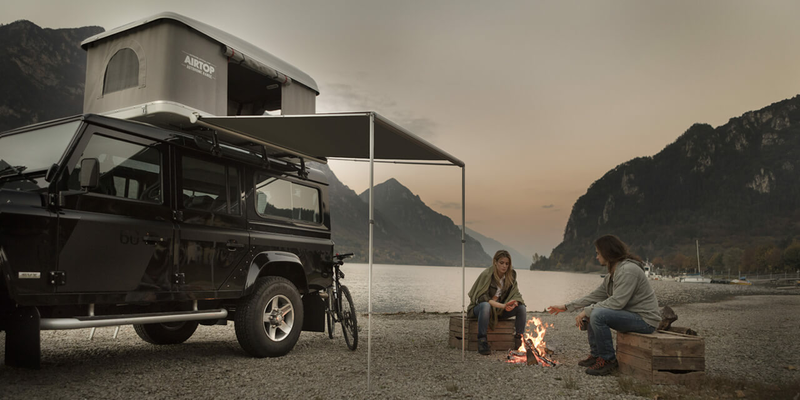 Includes: 4 Universal clamps for attachment to roof bars, 2 windows and 2 large doors all with mosquito-netting, 1 mattress and 2-3-4 pillows, 4 awning support poles (hold open doors to create awnings) 1 PVC travel cover, 1 height adjustable alloy ladder. Standard: all models are configured for side (standard) opening. 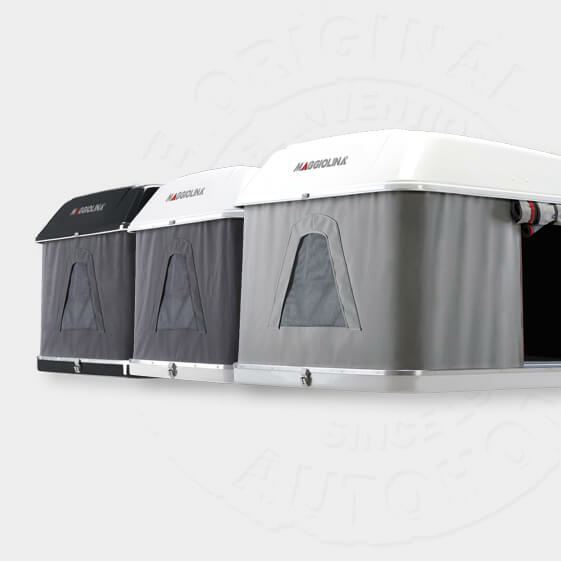 Includes: 4 universal clamps to fixing onto roof-bars, two triangular windows with mosquito nets, two large doors with mosquito netting, one mattress and 2/3 pillows, 2 internal pockets, 2 adjustable stakes for unfolding additional outdoor area awning, 2 stakes to hold up back door and create awning, 1 PVC travel cover, the roof stakes are equipped with condensate proof covering, 2 windproof tightening ropes included in the tent’s structure, multi-purpose hooks, the tent is pre-arranged for possible supplementary changing-room, 1 height adjustable alloy ladder. 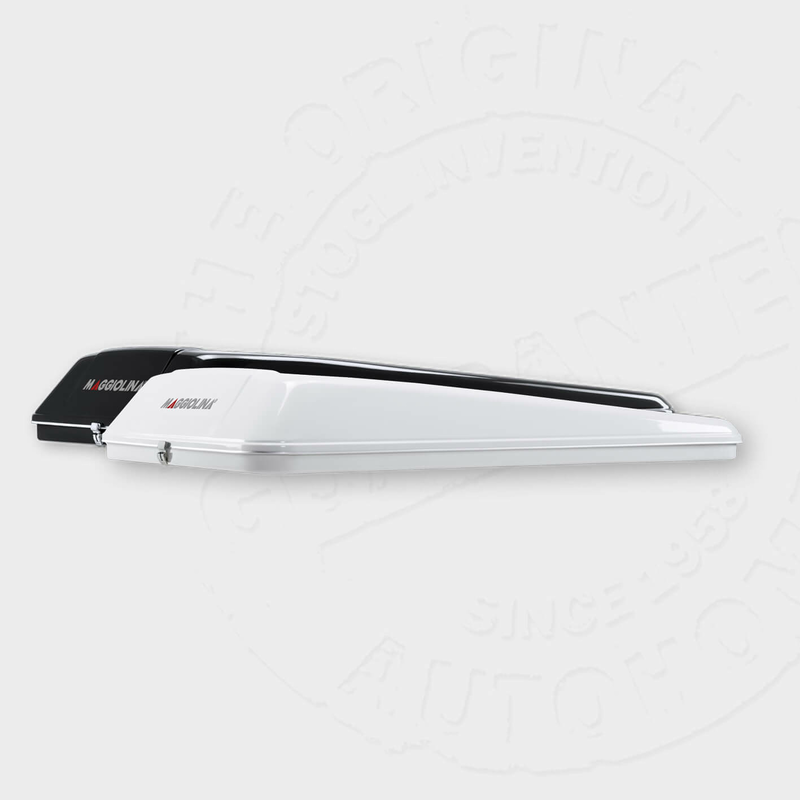 Standard: all models are configured for side (standard) opening. Optional: Explorer opening for opening over rear (or front) of vehicles. 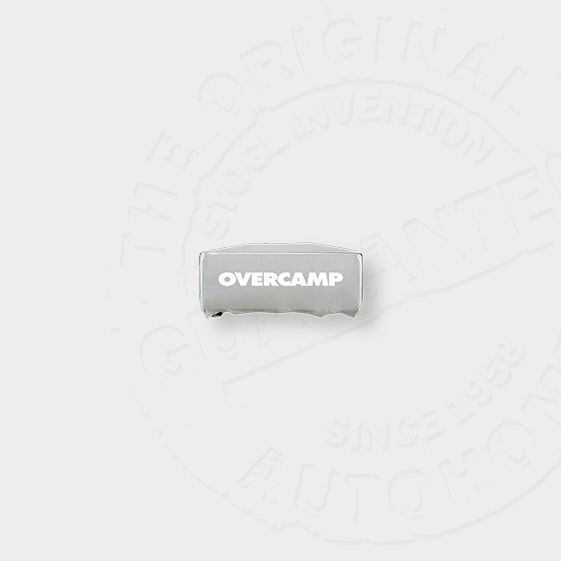 Overcamp, the roof tent in fabric. 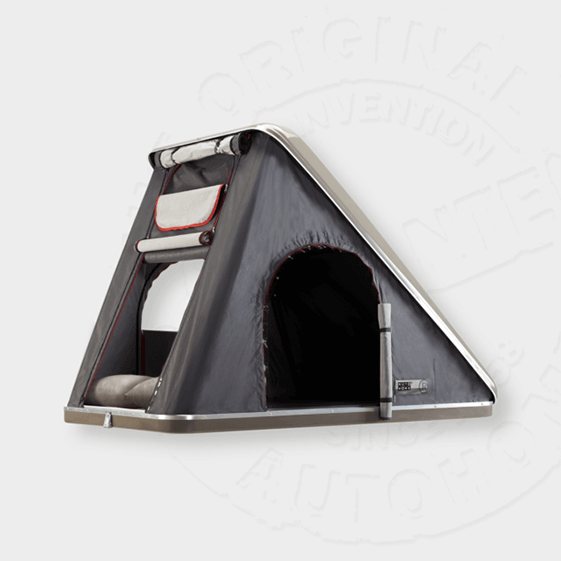 When opened, it fits the shape of the vehicle and can be used in public parking spaces, in camp sites or private parking areas (in the latter cases even if the tent does not fit the shape of the vehicle). 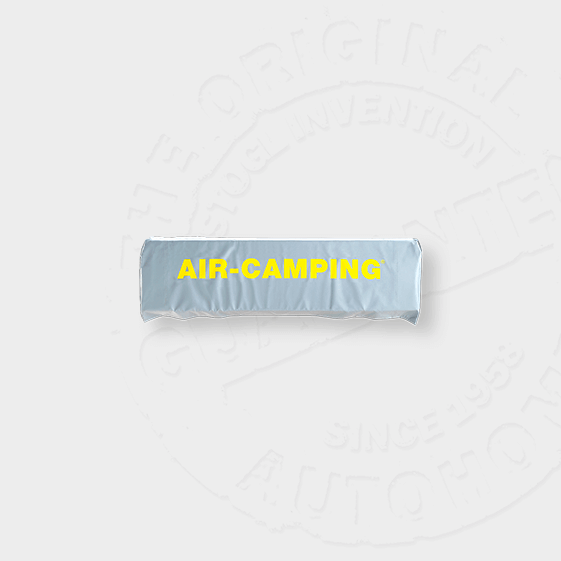 Includes: 4 universal clamps for attachment to roof bars, 2 windows and 2 large doors all with mosquito-netting, 1 mattress and 2-4 pillows, 2 awning support poles, (hold open doors to create awning) 1 PVC travel cover, 1 height adjustable steel ladder. The coupling can be made with the following: Small+Small, Small+Medium, Medium+Medium on large vehicles.